This entry was posted on August 1, 2015 by Theresa Frassrand. August, the month of the Immaculate Heart of Mary, remembers the miracle of Redemption through the participation of the faithful. Mary, Jesus' Mother, said yes to God perfectly. This came about as a result of grace, and no sin stained her soul, her heart. From Conception to her Dormition, Mary remained Immaculate. Her love for God, "her fiat" and beautiful interior life, is honored by Catholics. 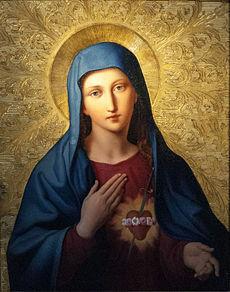 There are a variety of devotions available for consecration to her Immaculate Heart. Traditionally, her heart is depicted pierced with seven wounds or swords, in reverence to her seven sorrows.